Cream butter and sugar until light and fluffy. Add eggs, vanilla and almond extract. Mix until well combined. Add dry ingredients and stir just to combine. If the dough is sticky, add more flour. Roll out dough to 3/8th inch thickness. 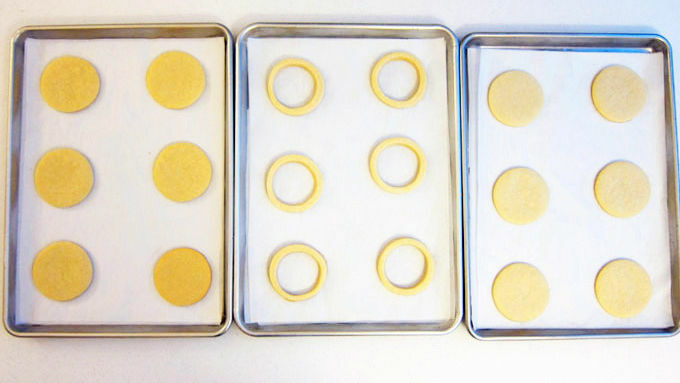 Cut 10 round cookies using a 3 1/4 inch round cutter. Remove excess dough, set on parchment paper lined baking sheets. Cut a smaller hole using a 2 3/4 inch round cookie cutter out of the center of each dough round. 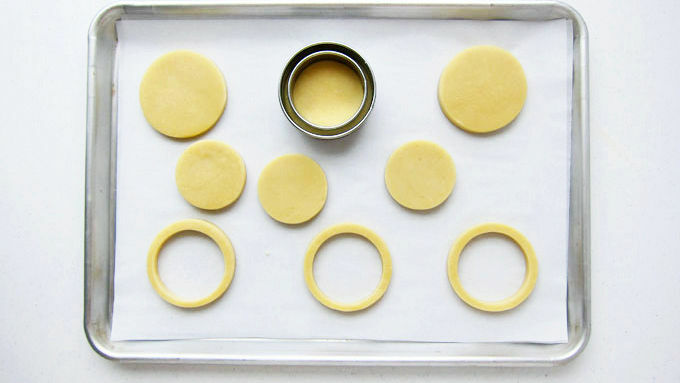 Remove the smaller dough circle, so you have 10 dough rings. Place the baking sheet in the refrigerator for at least 30 minutes. Roll the remaining dough out to 3/16th inch thickness, and cut 20 circles using the 3 1/4 inch cutter, re-rolling as needed. Set cookies on parchment paper lined baking sheets. Refrigerate for 30 minutes. Preheat oven to 350 degrees. Bake one tray of cookies at a time for 10-12 minutes until dry around the edges. Allow cookies to cool completely on the baking pan. 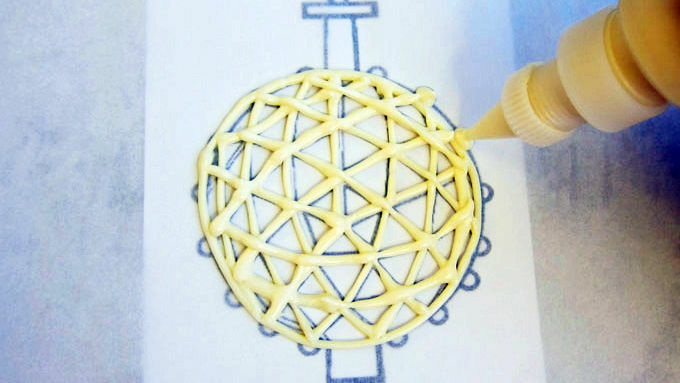 Re-size a Times Square Ball Coloring Page to 3 1/4 inches creating your template. Print it out and set it under a piece of parchment paper. Heat the white confectionery coating on high in the microwave for 20-second increments, stirring after each, until melted. Pour into a squeeze bottle. Pipe over the times square ball template. Carefully move the template and repeat. Allow the candy coating to harden then brush with silver luster dust. When cookies have cooled, frost 10 of them with white frosting. Set one candy time square ball on top. Sprinkle edible glitter, decorating sugar, or sprinkles over top, if desired. Pipe a thin bead of candy coating around the bottom of each cookie ring. Set one ring on the 10 un-frosted cookies. Fill with candy. 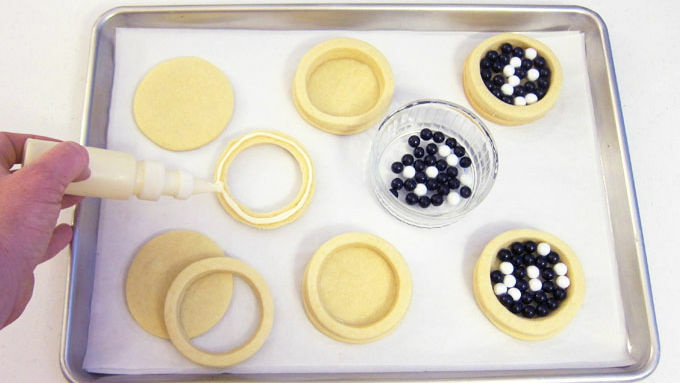 Pipe a thin bead of candy coating around the top of each cookie ring and top with a frosted cookie. Roll out white modeling chocolate. Cut out numbers from 1 to 10. 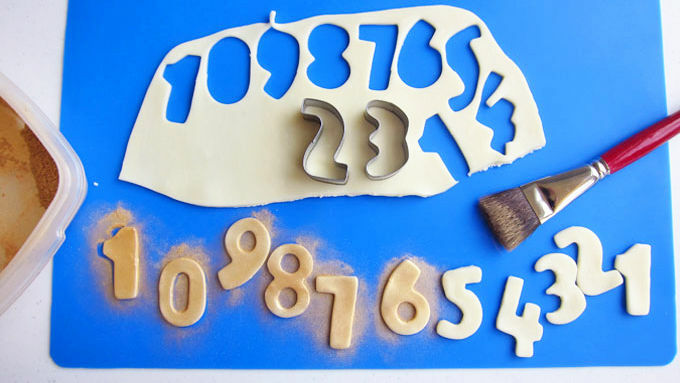 Brush numbers with gold luster dust. Attach to each cookie using a bit of candy coating. 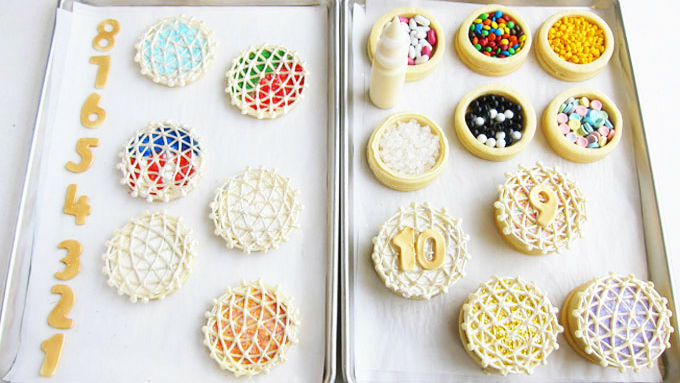 Countdown to the New Year with special ball-shaped cookies filled with candy! 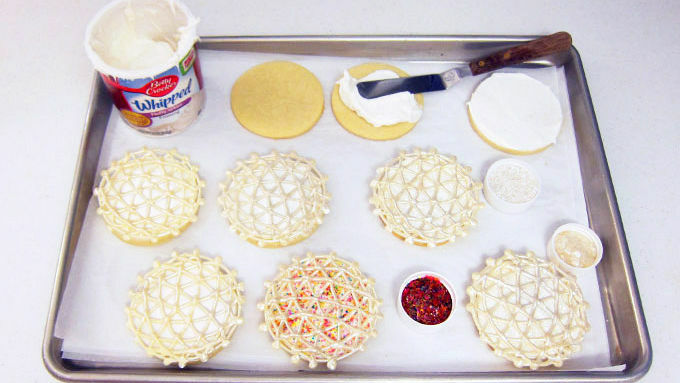 These ball drop cookies bring a piece of Times Square right into your home. We've been celebrating New Year's Eve with a ball dropping in Times Square in New York City since 1907. That's a lot of countdowns! The ball has changed significantly over the years; the most recent design is an icosahedral geodesic sphere made with over 2,000 triangle-shaped Waterford™ crystal panels lit by over 32,000 LED lights. It changes colors as it descends 141 feet in 60 seconds. Millions watch from the street and on television for a communal count down to the New Year. 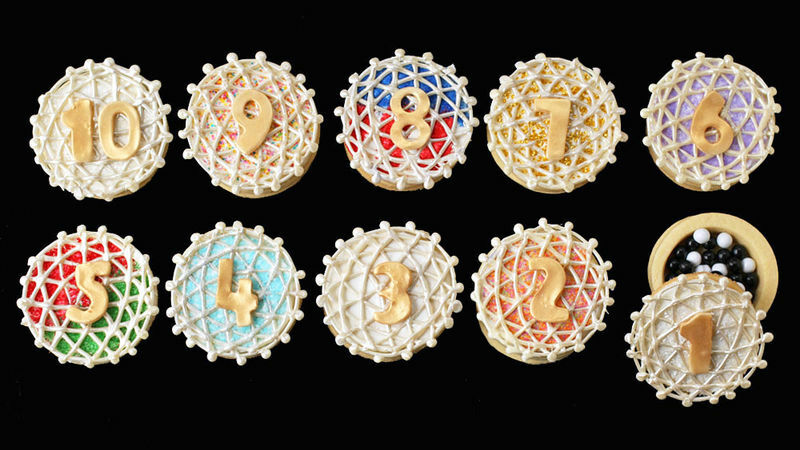 When I was asked to design a cookie to reflect the ball drop, I knew it would be overly challenging to make an actual replica, so I used a simple pattern resembling the ball and used it as a guide to create these very festive-looking New Year's Eve cookies. Each cookie is actually three cookies attached together and filled with candy. They're beautifully decorated to look like the changing colors of the Times Square Ball. Serve your cookies on New Year's Eve. Everyone can crack them open at midnight to reveal their candy surprise inside!